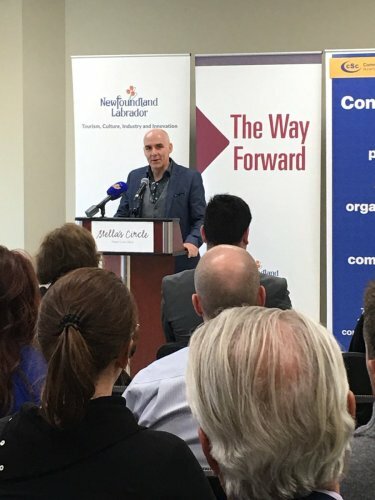 On May 30, 2018, the Honourable Christopher Mitchelmore, Minister of Tourism, Culture, Industry and Innovation, released the Social Enterprise Action Plan to increase the number of social enterprises in Newfoundland and Labrador and enhance services for existing social enterprises in the province. Minister Mitchelmore was joined by Lisa Browne, CEO, Stella’s Circle; Sheldon Pollett, CEO, Choices for Youth; and Penny Rowe, CEO, Community Sector Council of Newfoundland and Labrador, as well as Mark Browne, Parliamentary Secretary for Tourism, Culture, Industry and Innovation. Social enterprises use innovative business models to contribute to the economy by advancing social, community economic, cultural, and/or environmental needs. Operating in sectors such as tourism, construction, the arts, culture, fisheries, homecare and social housing; social enterprises successfully operate in all regions of the province helping to create employment, reduce poverty, and develop entrepreneurial skills. To support the development of the Social Enterprise Action Plan, engagement sessions were completed as well as a public online questionnaire. During this process, the Provincial Government heard views and perspectives from individuals and organizations about the direction government should take to support social enterprise development. Access to Financing and Capital. The action plan outlines 25 actions to be implemented over the next three years. One of the actions include an ongoing engagement approach where leaders who work in the social enterprise sector will be invited to participate in determining how things continuously move forward. Increasing the number of social enterprises and enhancing services for existing social enterprises delivers on commitments in The Way Forward to strengthen the province’s economic foundation. The Way Forward outlines all actions the Provincial Government is taking to achieve a strong, diversified province with a high standard of living, and can be viewed at thewayforward.gov.nl.ca.